Dave's Ravings: Hi and Welcome! Hello and HAPPY NEW YEAR to all my friends and fans out in the real world. This is the first post for my newly established blog. I will try my best to keep this fairly relevant and current. 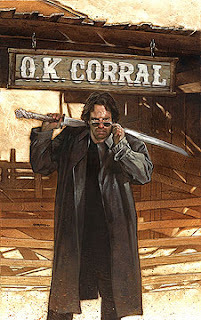 I also have a website that contains current work I am involved in(www.davedorman.com). The difference between there and here is that my art website will pretty much be that, an art website, with info and pics of what I am currently working on and a catalogue of past projects. This blog will primarily be me talking about all sorts of things that interest me (including my art as well as other artists') and a forum for questions and comments to be answered. I will also be posting art here, so as not to be too boring! For the first piece of art, an upcoming cover from my current ongoing stint as cover artist for Dynamic Comics' HIGHLANDER. Dave--Good to see you on the web! I look forward to your "ravings". Hey Dave, great to have your blog up and running, I'll link from my blog! Take care, and I hope to come and visit soon! Come on Dave. Tell us one of your stories. Maybe the one about when the hurricane knocked in your roof. Or maybe one of your San Diego ones. Like the one when Batgirl, Slave-girl Leia and Wonder Woman... oh... right, this is public. My advice is, forget about blogging and stick to painting. I'm sure you have some lackeys who can blog in your name. As my old professor Murray Tinkelman told me once "artists should paint and keep their mouths shut." A wise old man. Hey, where's your commentary about yesterday morning's "CBS This Morning" episode on Lichtenstein and Picasso and the sneaky art historian who used a fake term in his interview on camera??? Good thing you caught that one!